The Vika is completely made of synthetic materials, it is a "100% Vegan friendly" GP saddle. The EDIX is the synthetic version of the Courville. A treeless GP saddle that is suitable for long rides out, as well as jumping or dressage. 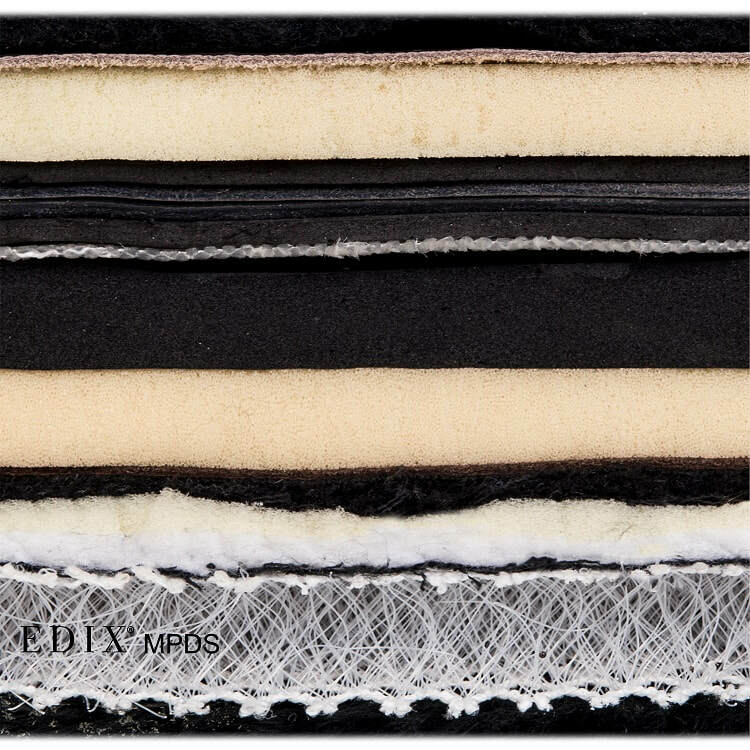 ​The EDIX® Vika saddles are available in the colors brown and black and in sizes small, medium, large, and a special children's size x small. The Vika consists of a 2-part superstructure of high quality synthetic leather and a substructure of treeless saddle pad including inlays. Because the EDIX® Vika is completely made of synthetic materials, it is a "100% Vegan friendly" GP saddle. An EDIX® treeless saddle optimally reacts to the movements of the horse. Partly due to this, the rider learns to adapt to the horse’s movements and, as such, develops an independent position. As a result, the movements of the horse and rider become one, and from there, excellent communication is created. Because the horse is moving much more freely, it has the possibility to develop optimally, which is often shown by an increase in muscle mass. Due to the above and after the habituation period, both horse and rider, show in all aspect of horse riding more relaxation and more fluid movement. An EDIX® treeless saddle offers your horse optimum pressure distribution using the special layers of flexible materials: MPDS, (multiple pressure distribution system). These soft, flexible layers adapt to the anatomy of the horse, as well as the rider’s posture. A complete description of the MPDS is included further down. EDIX® saddles advises you to buy the proposed treeless saddles complete with substructure (special treeless pad). This to achieve optimal pressure distribution. 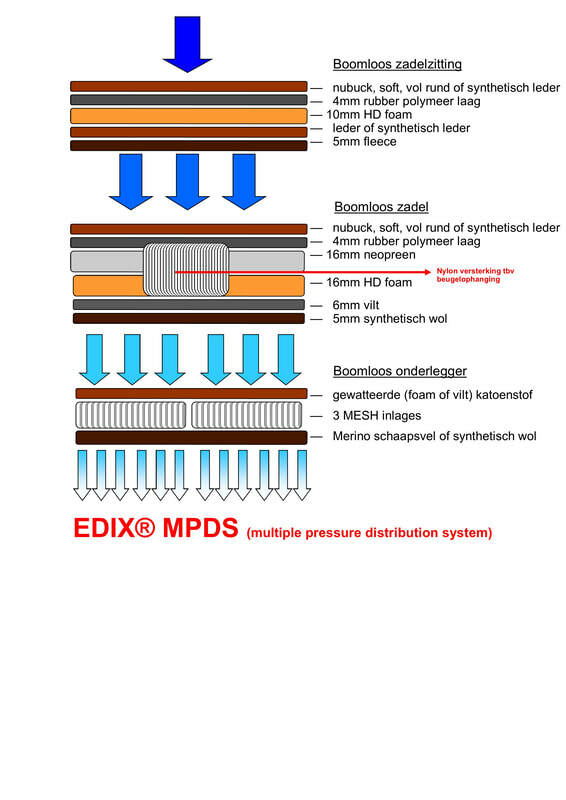 You’ll find more information in the extensive EDIX® documentation. ​Inlays are subject to wear and tear depending on the intensity of use and need to be checked from time to time for the residual force. These sets of inlays are available separately. ​The superstructure of the saddle: the seat (the saddle seat) - a leather seat with the first material that distributes pressure: a high density foam of a dense cell structure and a rubber plate of4mm. The underside of the leather seat is finished with synthetic wool. The substructure of the saddle itself, the part on which the saddle seat is located with important components for further pressure distribution. In this part we find separate anatomically shaped and pressure distributing layers, left and right. This separation is the first impetus for the eventual formation of a free spine. Separated 16mm thick foam (HD foam) of high density , in some models an additional layer of 6mm felt. Quilted cotton fabric , where in the different materials is chosen for foam or felt, with left and right separated, with velcro to open, slide-in pockets. The EDIX® treeless saddle combinations have high-quality components which together ensure optimization in the pressure distributing properties of the EDIX® saddles.